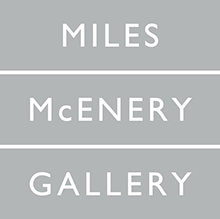 NEW YORK, NEW YORK – AMERINGER | McENERY | YOHE is pleased to announce paintingpainting, an exhibition of recent works by Franklin Evans. The exhibition will open 7 September and remain on view through 7 October 2017. A public reception for the artist will be held on 7 September from 6:00 to 8:00 PM. 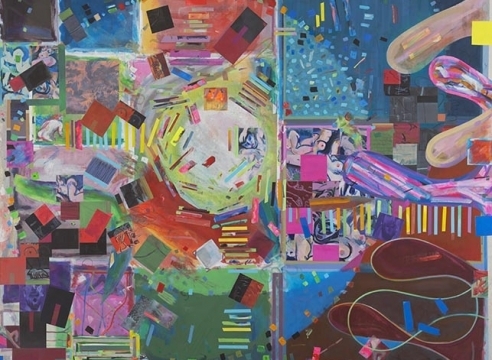 For the past ten years I have engaged with many elements of the artist’s studio—painting, drawing, materials, color systems, process trials, process notes, logistics, accounting, order, chaos, books, and art history’s visual records—and have made the studio in the round the subject of my paintings. I have typically presented the paintings in the context of installations of the exposed studio, nakedly incorporating various provisional studio processes and presenting a self-reflexive position that merges life and studio life. With paintingpainting, my second solo exhibition at Ameringer | McEnery | Yohe, in order to see my paintings qua paintings, I have extracted the work from the contextual world of the studio in which it was made, upending the form in which I have presented past paintings. Like my installations, these paintings are full of an overwhelming mass of visual information, swallowed from my studio. FRANKLIN EVANS (b. in 1967 in Reno, NV) received his Bachelor of Arts degree from Stanford University in 1989 and his Master of Fine Arts degree from the University of Iowa in 1993. He has had numerous solo exhibitions, including “XLtime,” Abrons Arts Center, New York, NY; “spreadsheetspace,” Prosjektrom Normanns, Stavanger, Norway; “headandhandinhand,” Spazio 22, FL Gallery, Milan, Italy; “juddrules,” Montserrat Gallery, Montserrat College of Art, Beverly, MA; “juddpaintings,” Steven Zevitas Gallery, Boston, MA; “timepaths,” Nevada Museum of Art, Reno, NV; “paintingassupermodel,” Ameringer | McEnery | Yohe, New York, NY; “houstontohouston,” Diverse Works, Houston, TX; and “eyesontheedge,” Sue Scott Gallery, New York, NY. Recent group exhibitions include “La lama di Procopio,” Nuovo Spazio di Casso, Casso, Italy; “2 Years of Looking,” New Art Projects, London, England; “Dynamic Pictorial Models,” 101/EXHIBIT, Los Angeles, CA; “Rock, Paper, Scissors, and String,” Weatherspoon Art Museum, Greensboro, NC; “Abstraction,” Fondation pour l’art contemporain Salomon, Annecy, France; “Premio Lissone 2014,” Museo d’arte contemporanea di Lissone, Lissone, Italy; “Material Images,” Johannes Vogt, New York, NY; “Paint Things,” deCordova Sculpture Park and Museum, Lincoln, MA; “Decenter: An Exhibition on the Centenary of the 1913 Armory Show,” Abrons Arts Center, New York, NY; “Greater New York 2010,” MoMA PS1, Long Island City, NY; “Collision,” RISD Museum, Providence, RI; and “El Museo’s Bienal: The (S) Files 007,” El Museo del Barrio, New York, NY. His work is included in many public and private collections including the Orlando Museum of Art, Orlando, FL; El Museo del Barrio, New York, NY; Yale University Art Gallery, New Haven, CT; Weatherspoon Art Museum, University of North Carolina, Greensboro, NC; Roanoke College, Salem, VA; Sweeney Art Gallery, University of California, Riverside, CA; Pizzuti Collection, Columbus, OH; The Progressive Art Collection, Cleveland, OH; and Collection AGI, Verona, Italy. He is a recipient of the 2017-18 Pollock-Krasner Foundation Grant, as well as a past recipient of the National Endowment for the Arts Fellowship at The MacDowell Colony, Peterborough, NH in 2016; Kennedy Artist-In-Residence, University of South Florida, Tampa, FL in 2016; Cosmopolitan/Art Production Fund P3Studio, Las Vegas, NV in 2015; and New York Foundation for the Arts (NYFA) Painting Fellowship in 2015, among others. Franklin Evans lives and works in New York, NY.